A good DJ is super professional when performing, but we all know that some people think selecting and spinning an amazing set is some easy, casual thing — and then treats them really disrespectfully, or just straight out interferes with their set. A lot of people don’t know they’re doing this, as the rules between crowd and DJ aren’t written on tablets or anything, so let’s go through a list of the things you should not do during a DJ’s set. Once the set begins, the DJ needs to focus on the mix, the setlist for which they’ve planned out in their head to ensure things flow smoothly and the room stays happy. While there are some exceptions (eg weddings) generally it’s not cool to make requests in the middle of a set, especially when the request is totally off from the musical vibe the DJ has been building. Doing so can throw off the entire feel of the party and the DJs flow. Song request rules 101 here. OK, while requesting songs before the set is totally cool, be sure not to request a whole set’s worth of songs. One or two is cool, more than that and you’re overdoing it. Also, be sure to write down both the song name and artist as there can be a lot of songs with the same name. A good DJ is a social DJ, and will totally share some words with someone in the crowd at an appropriate time during the set. But don’t saddle up to the DJ booth expecting a long discussion on whether Balearic is making another comeback, that new Drake track, or whatever. If you want to share some words, keep it short as your chat shouldn’t stretch beyond the low-minutes mark. This is one the venue really has to be sure to prevent. Nothing will freak a DJ out like someone already a few drinks in not-so-gently placing their mostly full drink within spill distance of the DJ gear (and the DJ herself too). It’s easy to remember: NO DRINKS on or near the DJ setup. Professional DJs like the Toronto female DJ crew here at LUXELIFE SOUND take time to prepare their sets to carefully create the right mood/vibe you want for your audience. This isn’t something they can do in a flash while the turntables get plugged in. It requires the application of real musical knowledge and research to assemble the set. So, organizers, don’t put your DJ in a tough spot. Make sure to tell them before the day-of what kind of musical genres/themes/vibes you want. Keep your fingers off the sound system! If you’re running the event and the sound doesn’t work for you, don’t jump in and start turning knobs in some really problematic attempt to lower/raise the volume. This can not only result in mid-set technical failures (goodbye party vibes) but also throw the DJ off. Unless you’re a sound tech, do not take sound matters into your own hands. Instead, ask the DJ or dedicated sound team to adjust whatever needs adjusting. 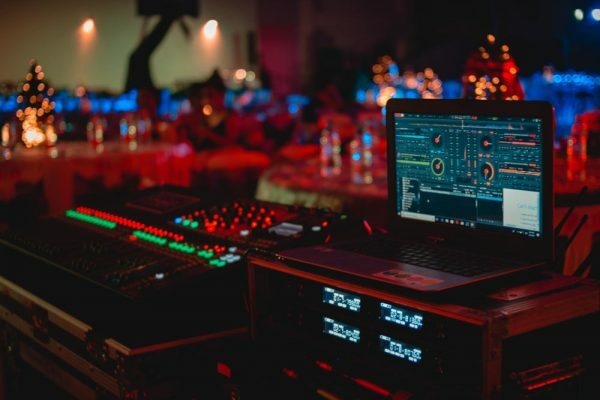 Remember, they all want your event to go great too — especially your DJ.